When do most people put their Christmas tree up? It’s an age-old question, a debate that’s (probably) ended friendships. Some swear by December 1st, some hold out right until Christmas Eve, some can’t wait until Advent. Well, sitting here in the back of the SendMe barn, debating the question yet again over a round of tea and Jaffa Cakes, we realised – we hold the key to answering this question. 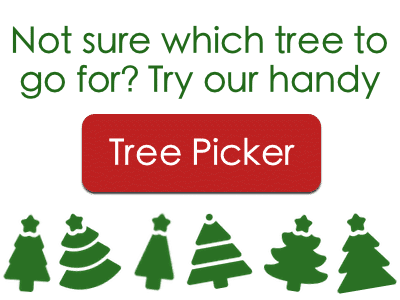 Year after year, our customers ordering online tell us exactly when they want their tree. We just needed some data nerds…. By a statistically significant margin*, December 11th proved to be the most popular single day in our study (yes, we’re calling it a study). 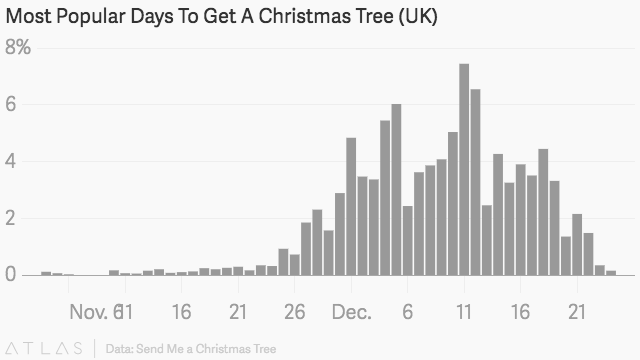 7.4% of Brits chose this day to put up their Christmas tree. December 12th came not too far behind (6.6%), followed by December 5th & 4th (6.0% & 5.4% respectively). Looking at these dates for recent years this tells us (rather unsurprisingly), that people tend to wait for the weekend to sort out the tree. Around one in five go for the second weekend in December (with the first weekend being the next most popular). Over 13% of us get our trees in November, whereas at the other end of the scale just 5% hold out until December 20th or after. 4.8% of our customers stick to the tradition of putting up their Christmas tree on December 1st. After the two “big weekends” it was the next most popular single date. So, when it comes to this question, it looks like we’re not going to agree anytime soon on when’s best. That’s fine by us – you can order your real Christmas tree whenever you please. *We’re not entirely sure what this means, but thought it sounded good.